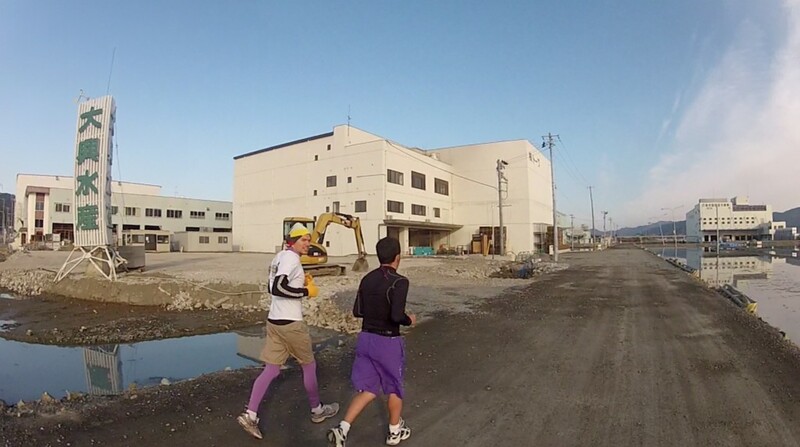 My latest Art of Running project saw me back up in Tohoku, the region of Japan so badly hit by the March 11th earthquake and tsunami. 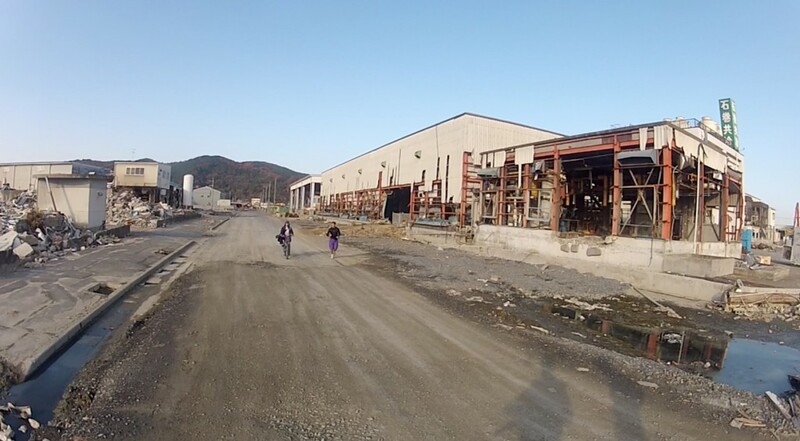 During last month’s trip to Sendai for TEDxTohoku, we made time to visit Ishinomaki, a fishing town that had both industrial and residential areas decimated by the wave. Whilst in the past I’ve carried out the majority of runs by myself, for this one I was very happy to have company: Jamie, founder of the volunteer organization www.itsnotjustmud.com, and Dean, of www.intrepidmodeladventures.com. 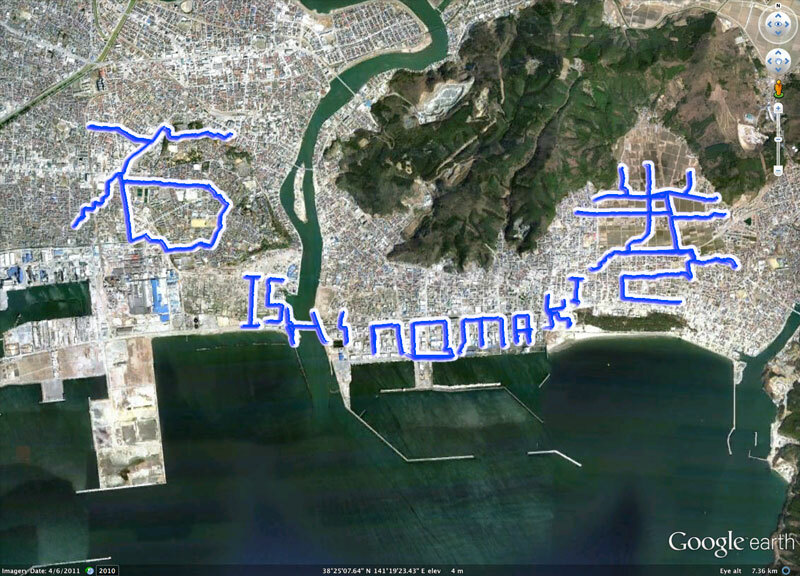 Our route, which spelled out ‘Ishinomaki’ in both kanji characters and English, was to see us pass through all of the distinct areas that make up the town: the part to the south that was no so badly hit due to its elevated location; the industrial / fishing sector that stretches right along the seafront and completely wiped out; the residential area to the north that was very badly hit; and the rice paddies nestled just below the hills that mark the eastern border of the town. Despite having seen footage of the area on TV and online, visiting the place for myself left me feeling shocked; I struggled to comprehend the extent of the losses inflicted upon the local community, and the amount of work that remains to be done some 9 months since the initial earthquake hit. I was also to discover than it’s only now that PTSD is really taking a hold, resulting in all manner of social problems. 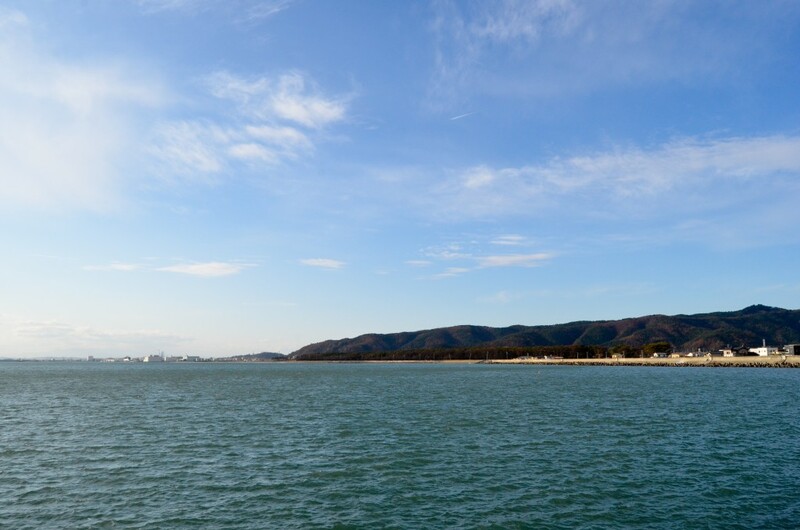 Basically, although the story of Ishinomaki (and countless other fishing towns along the north-east coast of Japan) is no longer in the news, a return to normality remains a long way off. They still need our support, it’s vital we don’t forget. 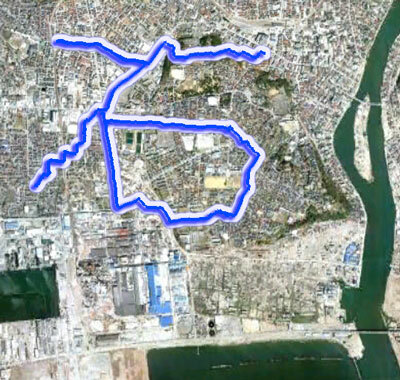 Our run began in a backstreet not far from the main railway station. It was here that we were to write the first kanji, ‘Ishi’ (meaning rock), a course of about 9km. 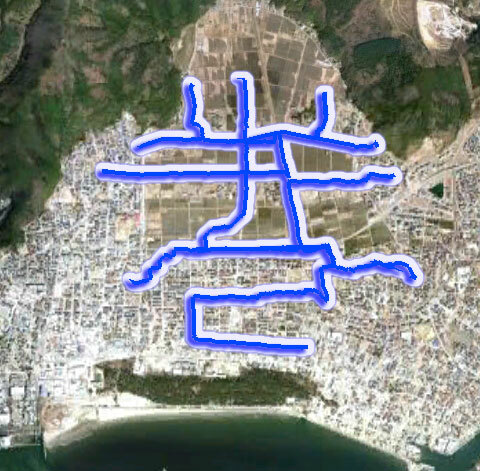 The route wasn’t overly complex, being just a series of long straight lines. …or so I had thought. It wasn’t long after we began that I realized just how tricky this was going to be, as the images I was using for my guide (satellite photos of the town taken not long after the tsunami had hit) differed somewhat from the reality on the ground, where the cleanup had been going on ever since. 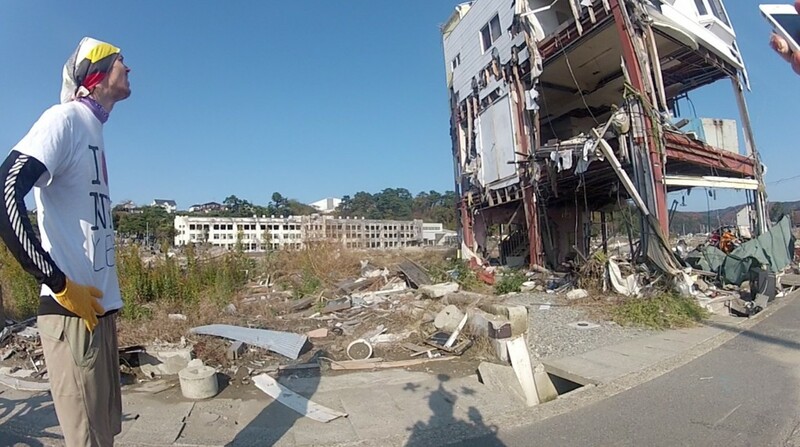 The Ishinomaki that I was running was indeed a very different place to that described in this report by 37frames following Dee and Tracey’s visit there just a couple of weeks after the disaster. Compared to back then the place was clean. 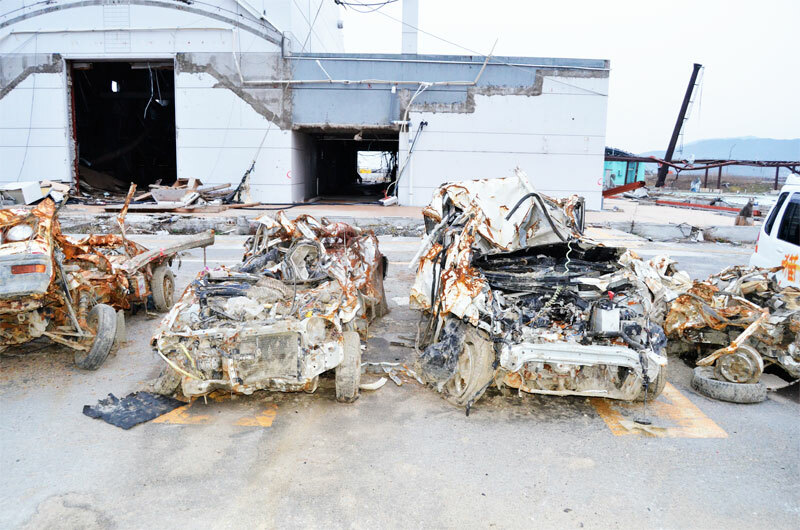 The cars, previously strewn across the area, wedged up against houses, wrapped around the remains of lampposts. 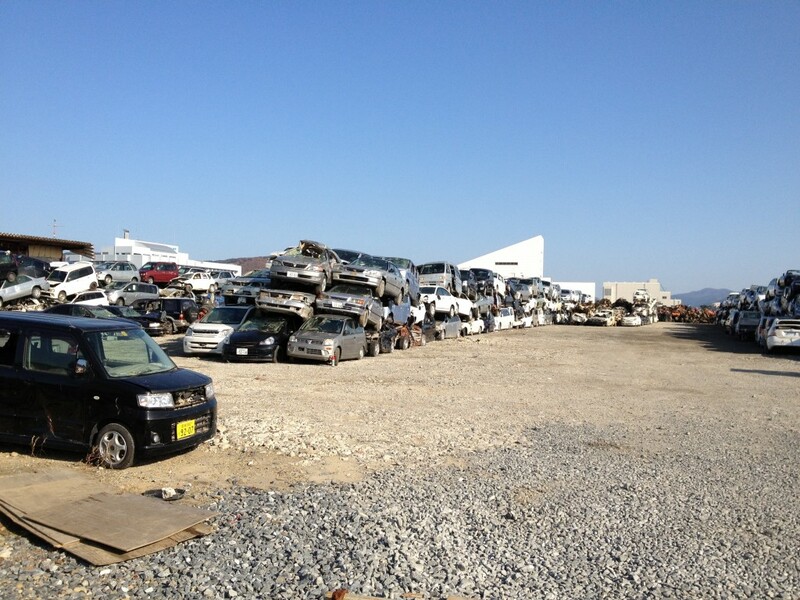 were now all neatly stacked up in a car graveyard down. The huge boats that had blocked the roads had been removed, and the mud which had coated everything, was mostly gone (partly thanks to the amazing work of my hosts for this trip, It’s Not Just Mud). 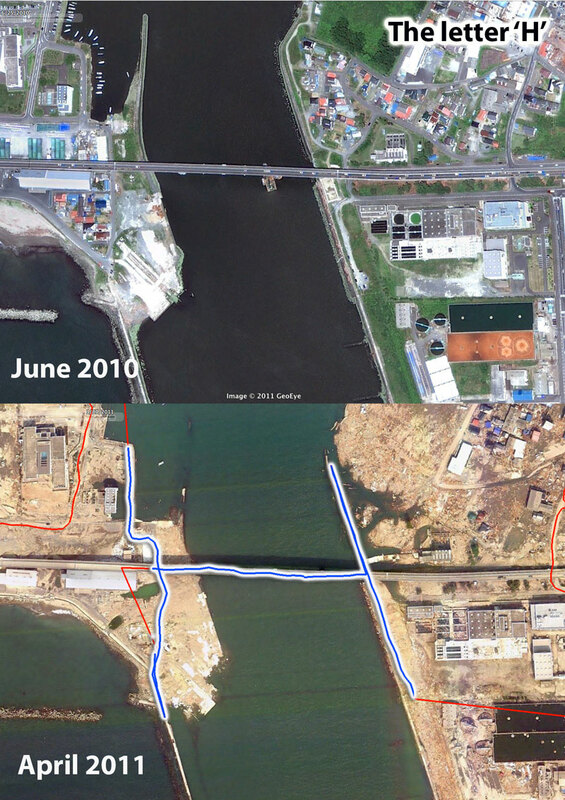 The piles of rubble I saw on Google Earth were also gone, as were many of the partially destroyed houses. 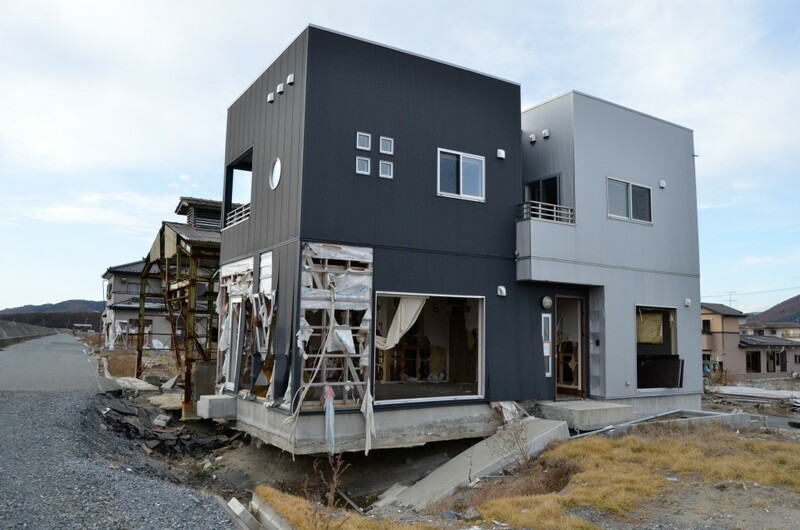 What surprised me however was just how many damaged houses and industrial buildings did remain, in what looked like much the same condition as shortly after the tsunami waters receded. The volunteer house were I had stayed the previous night was surrounded by abandoned buildings with sections of wall missing, some of which still had all of their contents piled up inside, encased in mud. And whilst the wreckage of many homes had been removed, the concrete foundations remained. 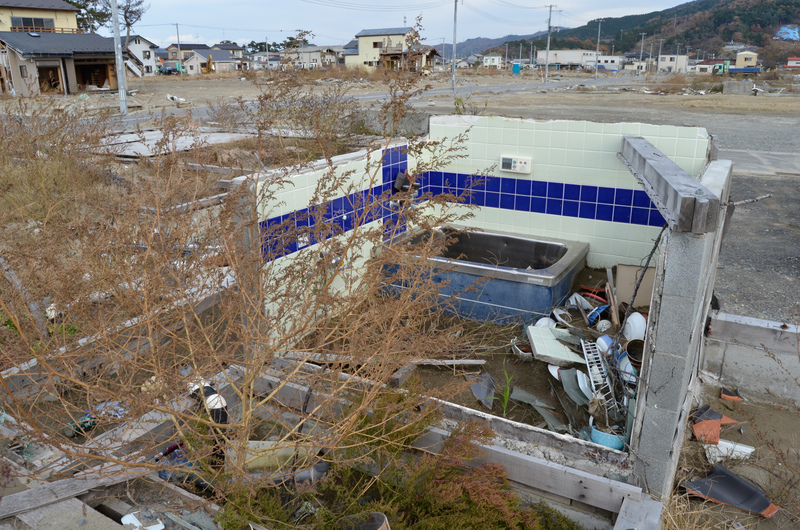 Occasionally we’d see what was left of the bathroom, complete with pipes sticking up out of the ground. Or, we’d see the gateposts and beyond them the floor of the entrance hall; I was told by a volunteer that when clearing homes, people would continue to use the original entrance, even if most of the walls were missing. The spirits remained. So whilst the drastic changes in the landscape made it tricky to follow our planned route at times, on the other hand, the damage actually made some parts easier, as we were able to cross ground that had previously had homes on. (I would add that we discussed if this would be seen as insensitive, but the feeling was that people really wouldn’t mind at all, rather they would like to see some life there). 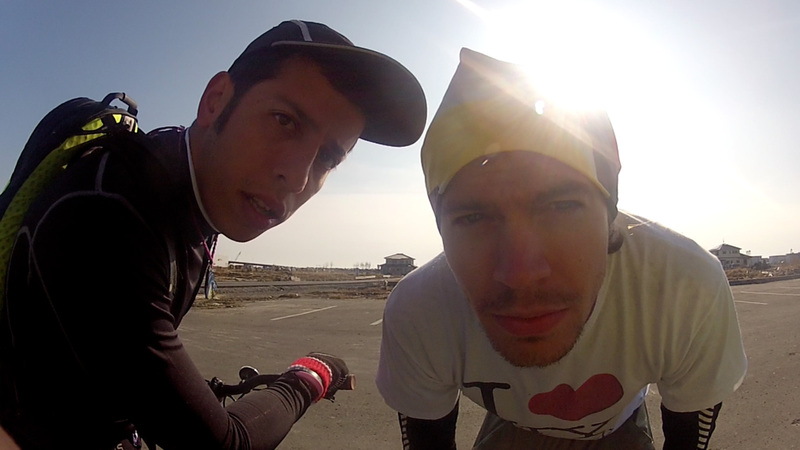 With the ‘Ishi’ under our belts, we headed down to the vast flat stretch of land that extends along the coast – this is where we would write the English for ‘Ishinomaki’. 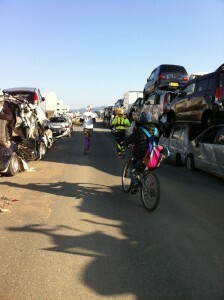 The starting point was in a sobering location – in front of the school that was now a blackened wreck. When the wave hit, cars piled up against the building before bursting into flames. The school, an official evacuation point, was gutted. The landscape there is now not unlike that of Hiroshima, shortly after the bomb was dropped. A flattened plain, with just the shells of a few buildings remaining. This area won’t be rebuilt. 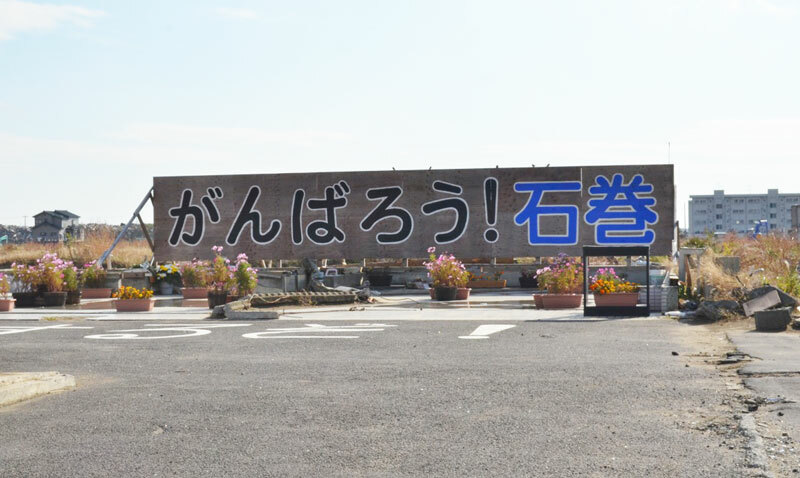 Not far from the school though, in the midst of this new plain, is a more positive sign – a big sign – reading ‘Ganbarou Ishinomaki‘, meaning ‘come on, let’s get through this / we can do it Ishinomaki!’ The site has become a place where people come to reflect, to gather strength. 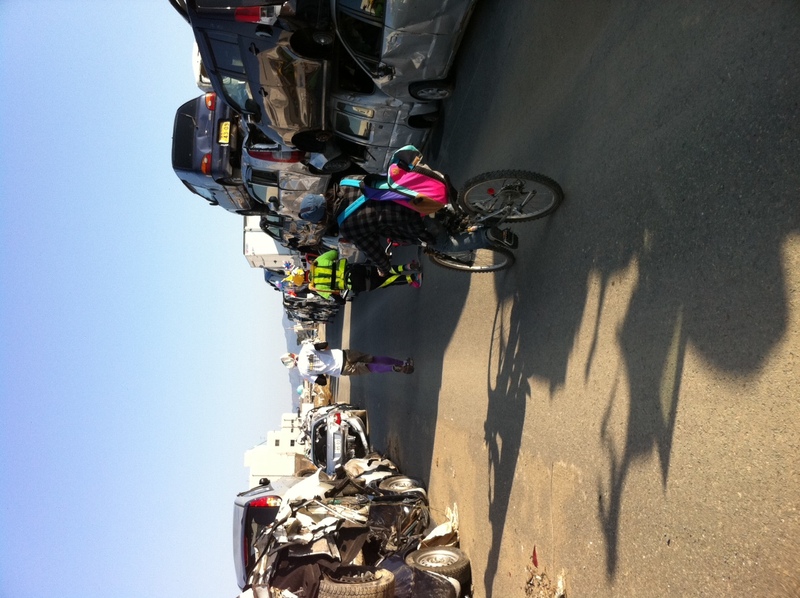 It wasn’t long before we ran into a challenge – our route was to take us through the middle of the car graveyard, but this was no longer a public road. As we turned into it a security guard came into view. I greeted him in a friendly manner, and said, “I guess we can’t come through here, right?”. He confirmed that no, we couldn’t, it was off-limits. 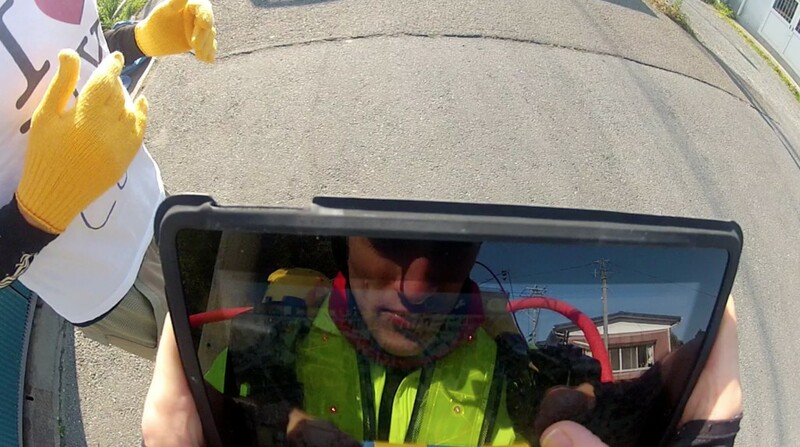 I went on to show him my iPad with our planned route, and explained that we had already written the ‘Ishi’ and that this road was an important part of the overall route – was there any possibility of us just running through, if we didn’t stop? On seeing that, his expression softened, “Well, in that case I think it would OK” he told us, and waved us through. We thanked him, and continued on our route. One thing I noted was that it was only once inside the car graveyard that you saw the most badly-damaged cars – they had been surrounded my many others that still resembled vehicles in a bid to hide them from those who may have witnessed the tsunami and be traumatized by seeing such twisted lumps of metal. The next challenge was the letter ‘H’, which incorporated the big road bridge across the river. It also took us right out to water and along the sea wall, from where we gazed out at the still waters. It looked so picturesque if one ignored the skeletons of buildings behind you; hard to believe that such a devastating force had come from here. Having crossed the river, we were now in the area that had hosted the fishing industry. Whilst it’s dominated by skeletons of factories that had previously produced canned fish and the likes, by the harbor a series of huge new temporary warehouses have been set up to process seafood catches. They’re made of some kind of plastic-canvas, stretched around enormous metal frames. As we ran through there was some activity, with catches being sorted and prepared for dispatch. 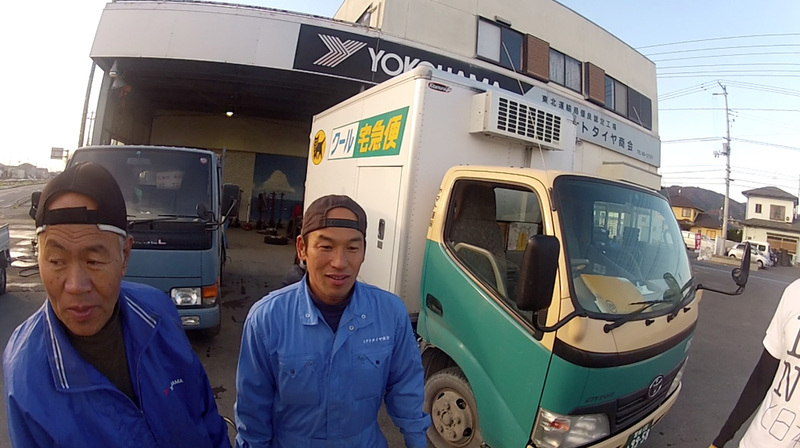 This had been the heart of Ishinomaki’s economy prior to the tsunami, so to see it back up and running was a very positive sign. With the trade comes the jobs, the incomes, the ability to rebuild lives. 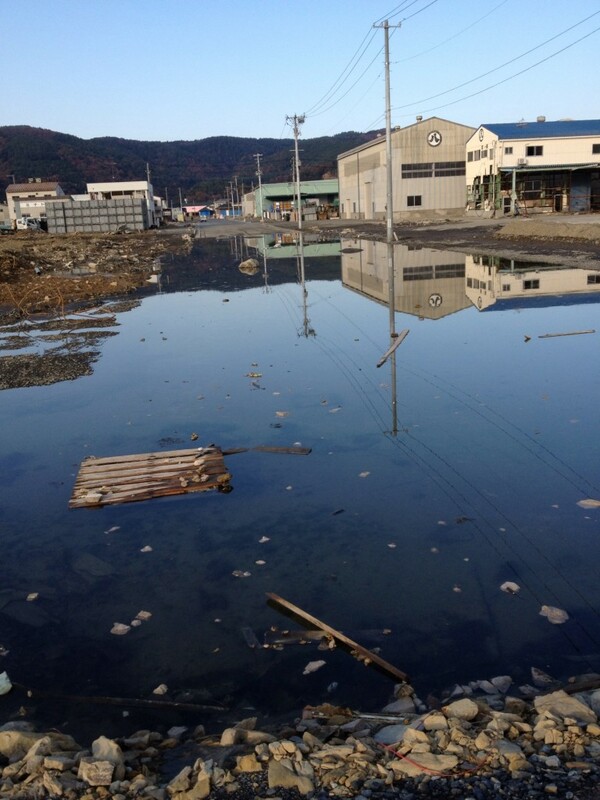 One of the roads in the fishing district that we needed to run down…! This is one aspect of the recovery that still has a long way to go, right across the town. 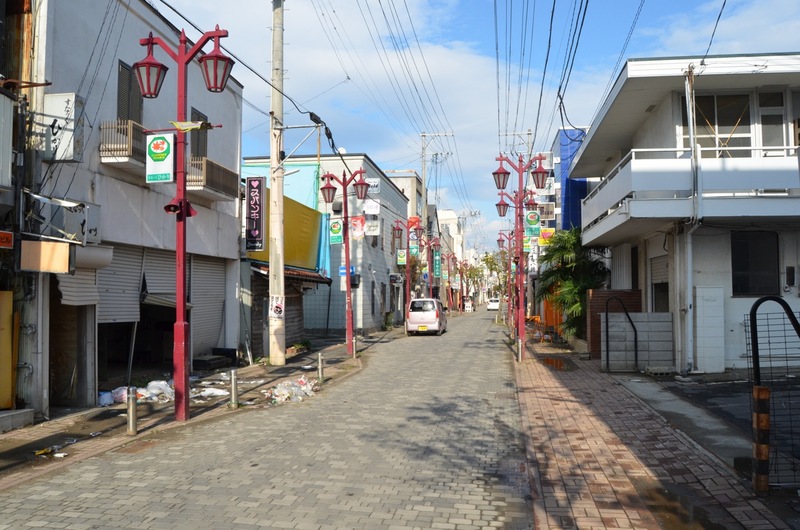 What was once the heart of Ishinomaki’s shopping district is just a strip of smashed shutters. 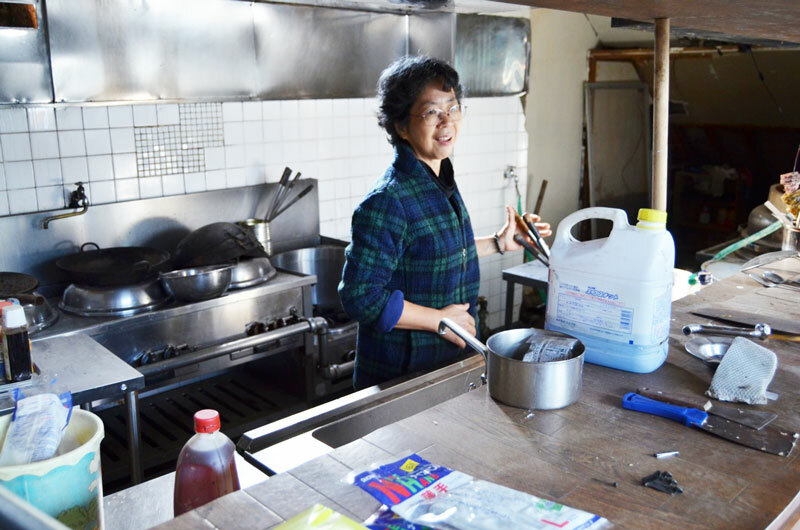 Local business owners may have had insurance against fire or earthquake damage – but not tsunami. Thus, for many, repairing and reopening just isn’t an option: they just don’t have the money. Along the main road, some of the big names in family restaurants and supermarkets have returned, as have the convenience stores. Whilst this is a positive sign, in a way it’s a shame that it’s these generic brands that can afford to reinvest, and not the locally-run businesses. There are exceptions however. Take the Nakayama family for example. They have a ramen (noodle) restaurant in what was once of the main shopping streets. 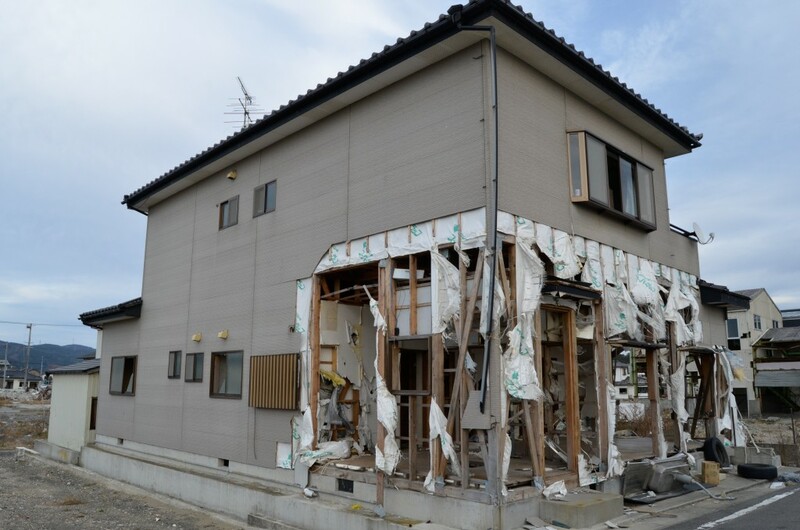 When the tsunami came it destroyed the lower floor, almost reaching the ceiling. The building however stood firm, and the family were safe on the 3rd floor. Since March they have worked tirelessly to clean out and rebuild the restaurant. When we first visited last month they were just waiting for the electrician to reconnect the internal wiring, then they’d be ready for business – one of the first to reopen in that street. I was very happy to hear via their daughter on Facebook last week that the restaurant has just last week reopened – may they do a roaring trade! It’s the return of businesses like this that I find the most positive. Whilst big business is vital for the recovery of the wider economy, the return of smaller shops shows that the community is getting back on track on a local level. There are efforts underway to get those who are now living in temporary accommodation back to work. One of the projects that the volunteers at www.itsnotjustmud.com are involved in is teaching residents of these new housing units how to make (and then sell) furniture. The effect of this goes far beyond having furniture in their homes or making some money to live off – it gives them a purpose to live. For those who’ve lost everything – home, job, family, this is a vital part of the recovery process. The ‘maki’ section was for me the toughest – and the most memorable. 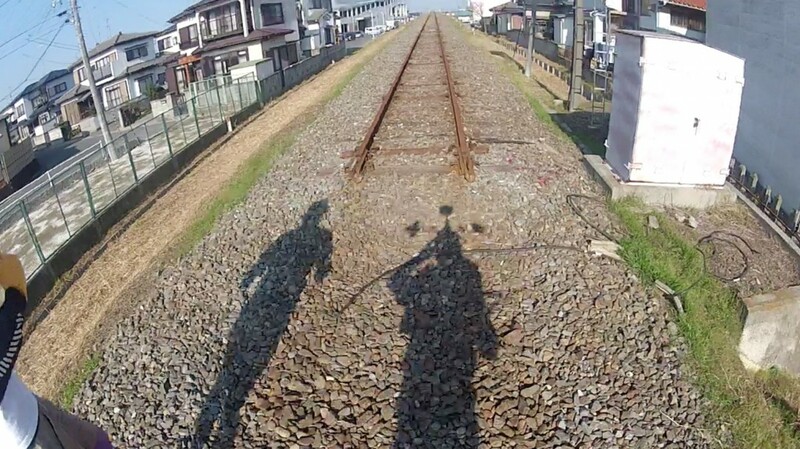 It took us up through the ruined rice paddies, along the closed railway line, backwards and forwards through destroyed residential areas, finishing not too far from the sure on a pitch-black road with the remains of deserted houses around. It was also the section where we met the most people. Whilst many communities were destroyed along with the houses, whilst carrying out our run I got a strong sense that those who remain have strong links, a shared purpose and are working together to put things back on track (which of course is to be expected). During our run we stopped and talked with many local people. We listened to their stories, and we explained what we were doing. 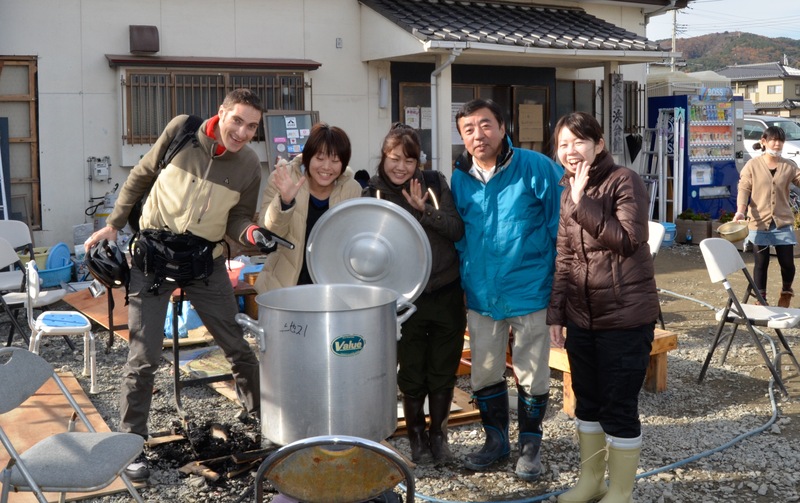 When asked by the NHK cameraman that was accompanying us what they thought of foreign volunteers who had come to help with the recovery, or people like us who were wanting to keep Tohoku in the minds of others long after the mainstream media had left, the reactions were overwhelmingly positive. At one point we met a chap in his 70s, dressed in a tracksuit, taking a brisk walk. He used to be a marathon runner, but these days preferred a more relaxed pace. We walked and talked, and he told us, on the verge of tears, how much the help was appreciated. On hearing that I felt tears coming to my own eyes. Further down the track we were ambushed by a group of children, who seeing these gaijin runners (one of them dressed in a crazy outfit!) went crazy with excitement and ran after us. 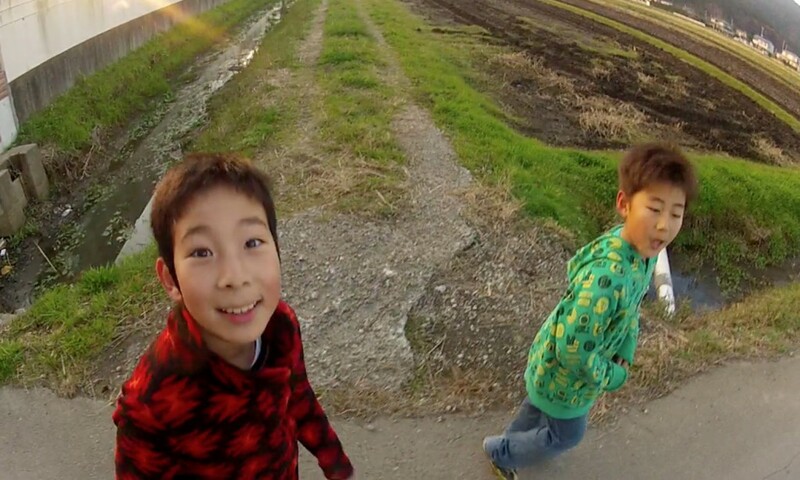 When we reached the edge of a rice paddy, surrounded by a drainage channel that was too wide for me to jump with the iRun on, they showed us another way, that brought us out alongside the old cowshed. One of the boys, aged about 6, explained that the cows had drowned in the tsunami, so they didn’t have any anymore. 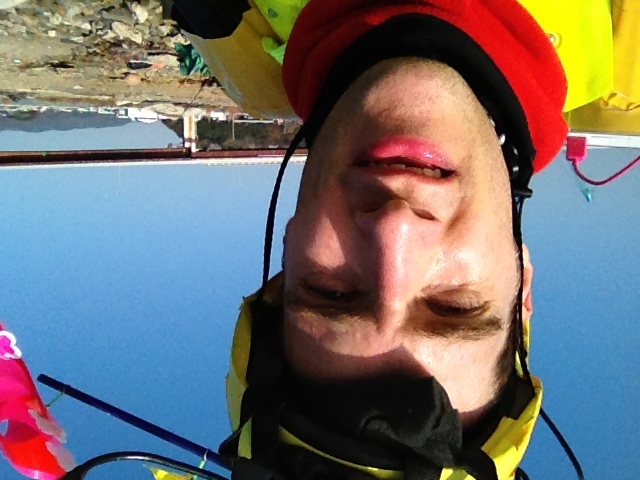 His mother recounted how they were shocked that the wave had reached them this far, 2km from the shore. It had rushed up the little rivers and railway line (now destroyed and unlikely to be rebuilt as it’s not a through-route), wiping out homes, roads, and leaving the (now barren) rice fields laden with salt water, the roads caked in mud. Volunteers had come and helped them clear the area, to the extent that you couldn’t necessarily tell that a tsunami and struck. By this time it was getting dark. 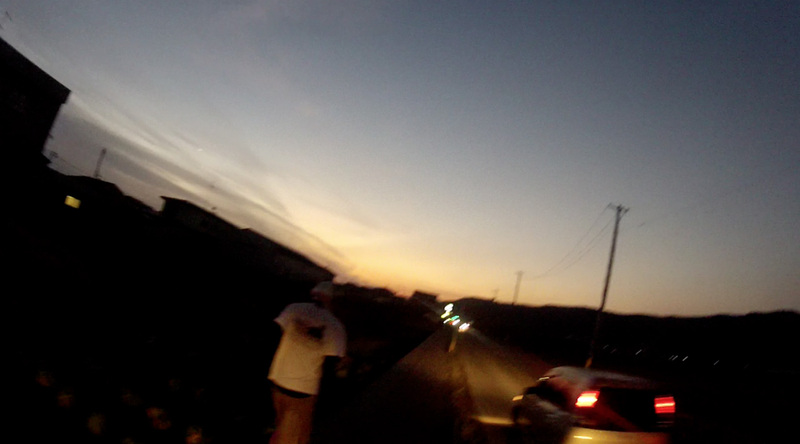 The run, which I’d initially estimated at taking about 4~5 hours had now taken 6, and there was still a way to go! 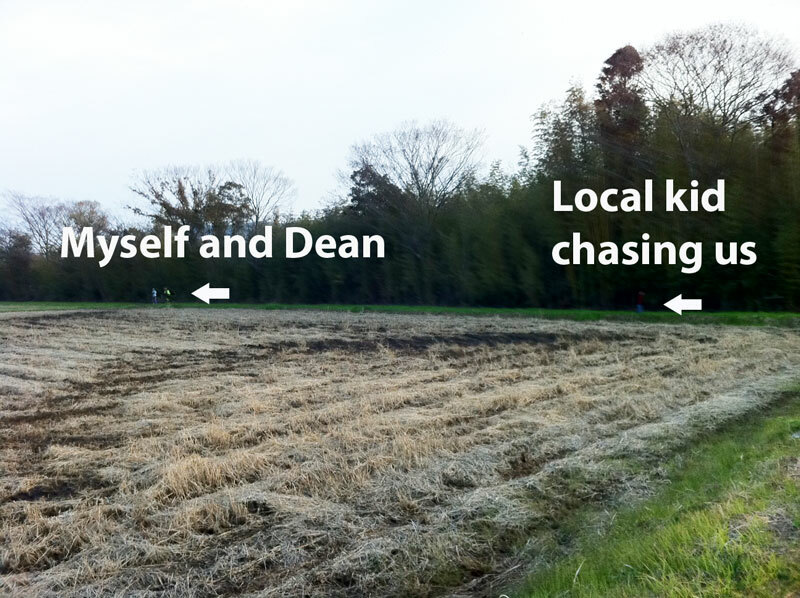 Dean was fantastic though, and without him running alongside of me I’m not sure I could have completed it – the iRun was really starting to dig in! The NHK cameraman was also a star, doing an awesome job of filming us as we crossed the area. Many times we’d reach a little river or the likes that meant that he couldn’t continue with the bicycle, so he’d head off to try and find another way around. He always found us again, partly as my iRun costume came complete with flashing red LEDs! And then there we were, into the final stretch. We sped up, delighted that we had actually managed to do this! It was a nondescript finish line; a point in the road where there was nothing but the foundations of former homes – and a streetlamp. There was a great sense of achievement. This had been a tough run; physically, mentally and emotionally. By passing through all these different areas and by meeting people all along the way, I’d come a certain way towards appreciating the magnitude of the disaster and how it had impacted this little town in so many ways. The local businesses, the big industry, the families, the farmers – all hit by this wave tremendous force …and yet each working hard to get back on track, to look forward, not back, and rebuild their lives. And yet there’s so much more to this than we could explore with a run. So many heart-wrenching stories, so many heroes. So many people who’s lives have been changed forever by what happen on March 11th, and whom will always bear the scars. 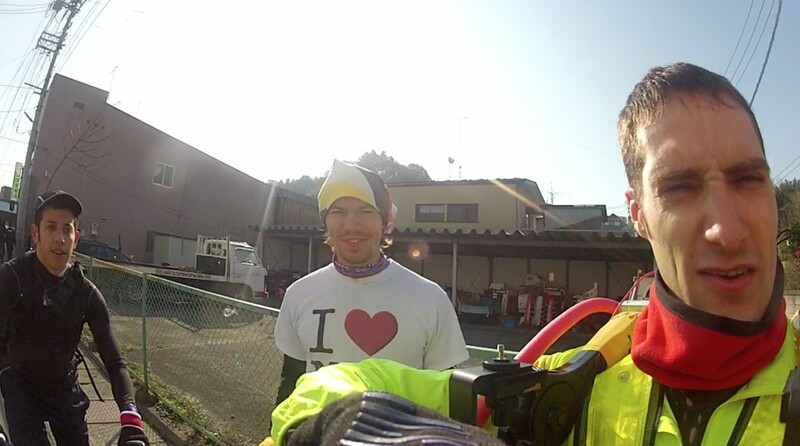 The following day I met with the head of a pre-school near Ofunato, following a performance by Guy Totaro, professional entertainer and Tyler Foundation Smile On! Ambassador. In our conversation, he summed up what is now needed. He told us how now, people are letting go. They have suffered the shock, they have held things together for 8 months because they had to, but now they have temporary housing and food, they can let go a little. But when they do so, they are hit by PTSD and the depression that can accompany it. Domestic abuse and divorce are on the rise in the region, as are the number of suicides. Young children who witnessed the tsunami and lost friends and relatives struggle to make sense of it, whilst those members of the older generation who have lost their homes, children and grandchildren are left with nothing. What was the purpose of their lives? These people need support more now than ever. The children need laughter put back in their lives, “they need to have their hearts soothed” he said. However, as far as the media is concerned, the story is old. PTSD doesn’t sell newspapers; there’s a lack of interest. Also, it’s far easier to raise awareness of a need for support by showing an image of destroyed homes, than it is by showing a family fall apart. 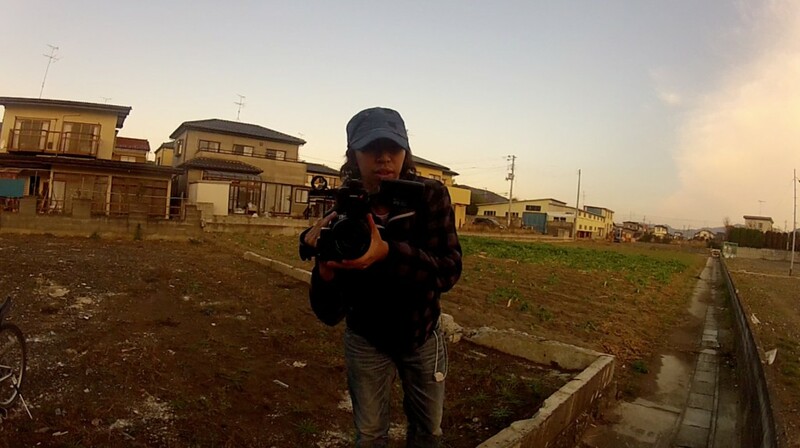 The fact is that the need for help in Tohoku is still there. Organizations such as www.itsnotjustmud.com will continue to need volunteers to help with recovery programs – not necessarily digging mud from ditches, but helping get businesses up and running, helping get the economy moving again, helping people put meaning back into their lives. It’s vital that this area is not forgotten, there is still so much left to do. I’m planning to return early next year and to continue to follow up on the recovery, supporting where I can. I’ll also be posting video footage from this project soon. My thanks to Jamie and the crew at Its Not Just Mud for running and being my host, to Dean for being a big help in the planning and execution of the run, to Carlos for his encouragement, to the community in Ishinomaki for being so welcoming, To NHK for filming the run (to be broadcast in late January 2012, follow me on Twitter for updates), and to my wife @twinkletame for supporting me throughout in so many ways. I’m very grateful to all. Thanks Dean. 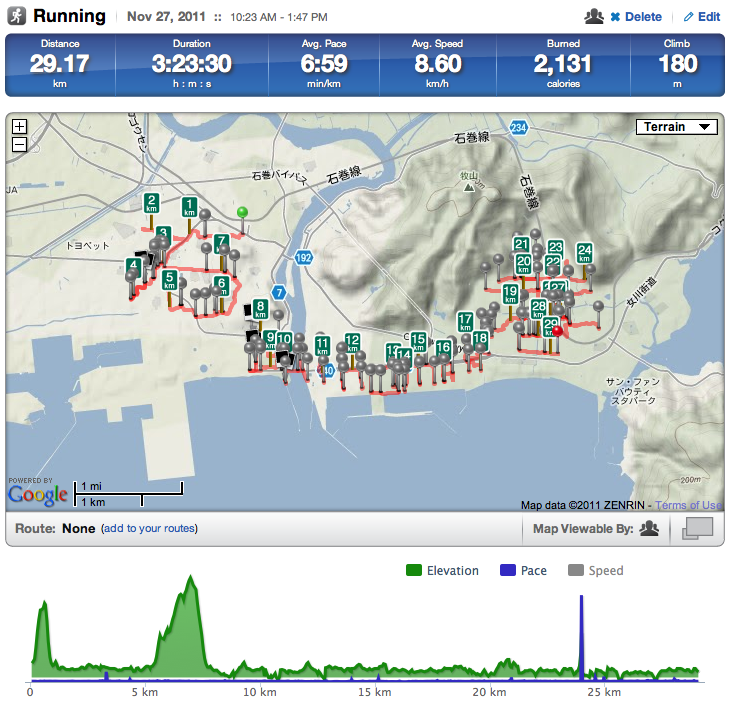 Awesome running on your part!